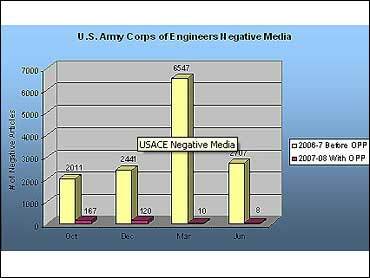 A New Orleans citizens group is accusing the U.S. Army Corps of Engineers of inappropriately using much needed funding to spin a more positive image of the Corps in the media. The federal agency, however, disputes this change saying the money was allotted for necessary "public education." The controversy was touched off this week after it was discovered that the small public relations firm, Outreach Process Partners (OPP), which has offices in Maryland and New Orleans, was hired to work with the Army Corps' New Orleans district in 2007. The company was awarded a three-year government contract worth a total of $4.75 million (having so far received $2.3 million of that money) and boasted on its Web site that it helped reduce negative news coverage that plagued the Corps following Hurricane Katrina. 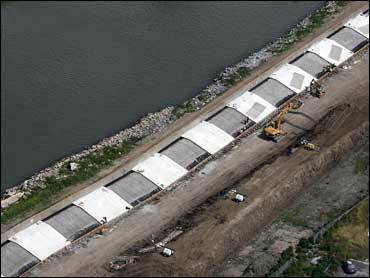 "It's a punch in the stomach," said Sandy Rosenthal, a citizen advocate who founded the watchdog Web site Levees.Org. "We do not feel that is the best way to spend [millions] of dollars." Rosenthal said she discovered the OPP contract Tuesday online. One of the things that caught her attention was a chart that OPP posted on its Web site showing how negative media stories had dramatically decreased after the company was hired. The Web site stated: "OPP's media support has been a fundamental part of the transition from typically negative news coverage to more neutral and positive news coverage." The Web site also listed several local and national news organizations that the company claims to have "facilitated" and to have provided "media support." "That sounds like spin," said Rosenthal who argues that the Corps' should in no way be spending precious taxpayer dollars trying to revamp its spotty public reputation but rather on trying to improve the levee system and protect New Orleans from another disaster. "I can see why people would be upset about that," said Ken Holder, the Corps' chief of public affairs for the New Orleans office. He told CBS News OPP was hired not to directly handle media inquires but to primarily develop "educational materials" and set up public meetings that the Corps is required by law to hold in order to get valuable feedback from residents about the Corps' projects. "It's for public education," he said. Right now, the Army Corps is in the mist of a major lawsuit that claims the agency is responsible for the flooding that drowned New Orleans following Hurricane Katrina. Click here to see the contract between Outreach Process Partners and the U.S. Army Corps of Engineers, New Orleans District. In addition, it is managing the largest civil engineering project in U.S. history to repair the damage that occurred after the 2005 storm at a cost of about $14.6 billion. Because of the size of the project, Holder said, "we've got to get this right and the best way to do that is to hear from the public." In a phone interview with CBS News, the president of OPP, Janice Roper-Graham, said she is proud of the work her company has done for the Corps and offered a different perspective on her company's relationship with the government agency from what had been posted on her company's Web site. "We are in a support role in helping [the Corps] with public education," she said. "And, we don't want there to be any confusion about that." Roper-Graham says the media information was listed on the company's internet page because she was "trying to reach out to other federal agencies, if they were having a hard time communicating" and she wanted to show "this measurable improvement" that her company could offer. "We didn't think through the Levees.org's perspective on how our Web site would be viewed," she admitted. Furthermore, the information was removed from OPP's Web site after Rosenthal's email circulated because Roper-Graham said she "didn't want to give the impression that OPP was signally responsible" for the decrease in bad press. "We are proud of our contribution" she said but insisted her group was part of a team effort with big credit going to the Corps' desire to be more "open and transparent." Roper-Graham said her company is in fact responsible for setting up public meetings for the U.S. Army Corps of Engineers in Louisiana as well as other communications duties "behind the scenes." She also said her company was instrumental in overhauling the Corps Web site, making it more user-friendly. All of this is important, she added, because "communication is a key component to running a good project." Late Thursday, Corps spokesman Holder had OPP remove all Army Corps references from its Web site until, he told CBS News, he has had a chance to review all the information.